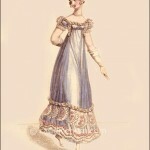 La Belle Assemblée, December 1816. 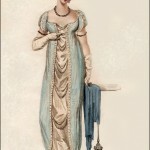 This dress shows the very high, almost minuscule bodice that was the fashion for evening dresses at this time. One wonders how a full-bosomed lady could wear such a bodice! The highly decorated flounce is also typical. Note the slippers, with laces up the ankle, which were known as sandals. The carved ivory fan mentioned in the description would have been like these, in my collection. “It is always with pleasure we see flowers forming the ornament of the British fair, for it is the support of many an industrious artist, and there is no ornament more appropriate or emblematic of female beauty. 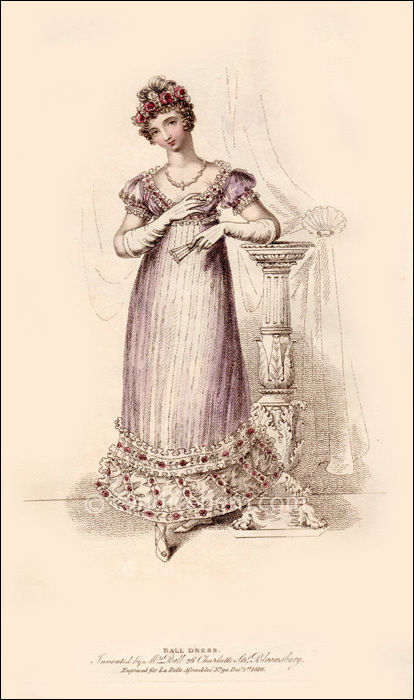 We are happy to say that now, no lady is reckoned completely dressed without she has a bouquet of artificial flowers, closely imitative of those of nature.” Such as those adorning the lady’s hair in this print.